Heroes come in all forms. Today, I want to recognize some of my true heroes. He may have been the inspiration behind the Insecure Writer’s Support Group, but writing is the last thing Rusty should feel insecure about. He knows how to draw one into a story and keep the pages turning at a rapid pace. The only bummer is in reaching the end, because I want more. He’s also a guitarist, and I’m sure a thousand times better than me. Rusty is my hero. Maybe one day my writing (and guitar playing) will rock half as good. Until that time, I will bow to the most talented person I know. Honored to call you my friend, Rusty! The guitarist for Dream Theater never ceases to amaze. A perfect example of technical wizardry married with musical brilliance. 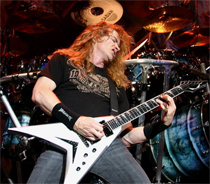 The shred master and genius behind Megadeth. Just listen to the “Rust In Peace” disc and you’ll see that Dave is a shredding genius. The Hunger Games once again dominated the box office, and has now made over $362 million dollars worldwide. However, this Friday there are two big releases: Lockout and The Cabin in the Woods. At the moment, Joss Whedon’s Cabin is as 92% on Rotten Tomatoes and the reviewers are saying it redefines the horror genre. Yes, I am very stoked! The Challenge posts have been amazing and some feature really original themes. I’d like to point out one of my favorite so far at The Waiting is the Hardest Part. Heather has brought back Stormy the Gnome and is photographing his adventures throughout the month. Last week we had Indiana Gnome and a round of 'Find the Gnome.' For a good laugh from a wonderful blogger, check out Heather’s site. Are you following the talented Rusty? Any musicians who’ve influenced you or that you really admire? Have you contributed to The Hunger Games’ box office take? Following Heather and Stormy? And who is the hero in your life? Okay, had to be quick in case someone else beat me to it! Lol. I haven't met Rusty. Rushing over to follow him as soon as I click publish this comment. I've contributed three times to The Hunger Games box office. I'm not ashamed of that either, lol. i just started following rusty recently, and he's a fine fellow for sure. super talented and kind to boot! Hope you had a happy Easter with family and friends. I forgot to wish people in advance. I admire those who can play musical instruments and love listening. I read the first of Hunger Games, movies tend to stray of course - even HP towards the end of the series so this purist is still sitting on the fence. I'm not following Rusty, but am going to go check him out. And I haven't had a chance to go see The Hunger Games, but I want to. I have a lot of heroes, too many to name them all. Ha! Heroes is my "H" for the day, too. Mine are vastly different from yours, but I think Rusty just made the short list:-) He sure makes his words flow effortlessly (and therein lies the sweat). Lemme guess, you like the git-ar. So does my husband, and I could listen to him play his handmade (one of the last) Breedlove all day long. When we first met and didn't know each other very well, he played me a song that was my life story, only he wrote it years before I came along. It was love by the first bridge. We have yet to make our contribution to the Hunger Games ca-ching, but only because the movie theaters are few and far between around here, but we'll get there. Great post. Can't wait to see what you've got cooking for "I"
Influences, I have to say Jerry Cantrell (Alice in Chains) & Adam Gontier (Three Days Grace) have both influenced my writing & stories. No on Hunger Games, though I do want to see it. I just want to read it first. And I have 3 heroes in my life: my husband, my son, & my best friend/CP/writing soulmate. I've seen Hunger Games...thinking about going again tomorrow when my kids are at daycare, since I'm still on Spring Break. Off to check out some new sites. I have to check out Rusty. Jack being a professional musician and guitarist has a whole list of great musicians. Me, right now I can only think of one... Clapton. Unfortunately, our limited budget doesn't allow for going to the movies much. But I think my sister and nieces have more than made up for me. I haven't seen the Hunger Games yet. I'll likely wait for the DVD release. I want Stormy the Gnome!! Want, want, want! LOL!! Awww how utterly adorable! Yay!!! Am leaving Hunger Games to the young'uns and young at heart and am going to see Pirates! Band of Misfits instead - totally for the even younger 'uns and younger at hearts like moi!! Oooh I did just watch a documentary on Bill Withers - "Still Bill" - wonderful! My "H" topic is Hero, too. Great minds think alike! It seems I belong to a minority when it comes to The Hunger Games. I was neither interested in the books nor the movie. Thanks for featuring Rusty. And I'm looking forward to Cabin in the Woods. Off to check out Stormy the Gnome! I seen Hunger Games the opening night, so I did contribute to the numbers. I have lots of heroes. Mostly, my family and the awesome writers that I get to know and read their books. Lots of questions Alex. Thanks for introducing us to Heather. Must check our her posts. I follow Rusty. No, haven't been to Hunger Games yet but must. I love Slash from Guns 'n Roses and my father is my hero. Thanks for your regular visits Alex. Don't know how you do it but it's much appreciated. Dawn, you have good taste! Rek, you're not convinced, huh? And one of these days I'll record myself playing. Maxine, handmade? Very impressive! I just play. Couldn't ever build one. Nancy, those are excellent heroes. And Cantrell would be on my list as well. Pamela, what does he play? Kitty, he and Charlie would get a long well. And I want to see Pirates, so we are both young 'uns at heart. Jeremy, you need to check out some Dream Theater then! Edi, good choices. Not interested in the books but will see the movies someday. Anna, and we still have eight months to wait!!!! Julie, hope you're joining us. Great musicians there Alex my hero dosen't play a musical instrument but boy he can sing. I don't know if I am following rusty! I'm gonna go check him out! And my hero is definitely my husband. Don't know where I'd be without him. I heartily agree about Rusty. Super guy, great blog. I have not followed Rusty yet! I must do so now. Also, Stormy the Gnome?? Must check that out too! LOL! Hunger Games is way better than I had it figured that it would be. I''l check out your pals. Journaling woman sounds wonderful. My hero? My hubby because he is such a humble man. And he loves me and reads my first drafts. My son Christopher who was born with a rare brain disorder. I love him soo much and I look up to him. And Lenny too. Oh dude, I am so not going to cry. But I almost don't know what else I can do. You're the best, really. Crap' why are my cheeks wet? Denise, that is wonderful your father is your hero! And trying to keep up with everyone. I've enjoyed your posts for the Challenge. Katie, now I feel bad - I should've included my wife. Robyn, those are wonderful heroes. And Rush is awesome! Rusty, you're welcome, and don't let anyone see you. What a great friend you are. Rusty is awesome. You have steered me towards some of my absolute favorite blogs. I can't thank you enough for the shout out. I really appreciate it. I'm so glad that Stormy is entertaining the nice people who come to visit! Thanks from the bottom of my heart. I follow two of those awesome bloggers. Awesome ax men. And heck yeah I cannot wait for Cabin! Gave my $$$ to The Hunger Games. I didn't like it any more than the book. Saw a preview for 'Cabin' - YIKES! I know Rusty. I'm pretty sure I met him through you. I especially like his artwork. I haven't seen Hunger Games yet, but I haven't read the books either! I have met Heather and Stormy - they're great! I adore Joss Whedon's work - but I'm a total wimp when it comes to horror so I'll have to give that one a pass! I think some of the coolest guitarists are Axl Rose, Eric Clapton, Brian May, Carlos Santana (I loooove the guy), Mark Knopfler and tons of others! I started following Rusty recently. He does seem to be multitalented, which would make me feel inadequate if he wasn't so nice! I love seeing where Stormy the Gnome travels! :) I'm a follower of Rusty already, and love his blog. Oh, and yep, I'm signed up for First Loves Blogfes! I'm shocked by the success of Hunger Games. Yes, it's a good movie, but not an amazing one. I hope it only gets better with each entry. I'm SUPER EXCITED about the Cabin in the Woods. The tired horror genre needs to be shaken up, and I think this movie will do this successfully. Heather you are welcome on all counts. Your Stormy posts are the best. And Cabin is going to be awesome. Susan, I do remember Kottke. Melissa, he is a true friend. Michelle, some real classic guitarists there. Nick, he is both nice and very humble. Billy Gibbons might be my favorite guitar hero. Stormy the Gnome? I must see this! Going to go follow Rusty now! I'm more for drummers - Dave from Korn to be exact! Been following Rusty...in fact, I think I found your blog through him. Very talented indeed. I did my part with helping to propel The Hunger Games to the top. Saw it twice. Took my oldest son to it on Friday. I'm sad to say I haven't seen the Hunger Games yet, but I'm promised a baby sitter for next weekend, so maybe it will work out (crossing fingers). I am too broke to jump into the Hunger Games thing yet but have a book on hold at library. I follow Heather and the gnome. Gotta get to the theater to see Hunger Games still. And I have not met the gnome yet. I loved the movie Amelie with the traveling gnome. So funny. Rusty and Stormy the Gnome are awesome. No Clapton with the guitar playing guys? 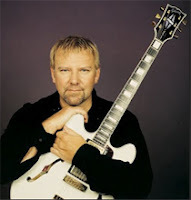 Alex Lifeson! And my husband is a fan of Dave Mustane. I do follow Rusty and Stormy the Gnome. Both awesome blogs. I'm also pleased to report that I have heard of all your featured guitarists. Last Christmas, I even went on a hunt for a John Petrucci songbook. The folks at the music store were surprised because apparently, I don't look like someone who would know who John Petrucci is. I hadn't seen any of Rusty's sketches, so I went and checked them out. Haven't seen The Hunger Games and don't think I will. I'm a fan of Rusty's blog, which I originally found through you - so thanks! And I'm definitely a fan of Dream Theater. Could not be more excited about anything Whedon wrote, directed, influenced or touched. Can't wait for Cabin in the Woods. I wanna see Lockout. THG not so much. Electric bass is my primary instrument, so by law I am Rush fan. Few bands have ever had such a concentrated mix of talent. Thanks for the updates! Looking forward to Cabin in the Woods. And these are all awesome guitarists. I was a big Dave Mustane fan back in my head banging 80s days. Jay, you've paid your dues then. KD, those are good heroes. Tonja, he'd be in there somewhere. Suze, you are both super cool then. MJ, you need to show them then! Not sure I'm ready to attempt his level of playing though. Susanne, I probably won't make it either. SL, Cabin is going to rock. Rick, they do boast the best of the best when it comes to talent. I KNEW Rush would make your guitar hero list... And I think Cabin in the Woods looks great, too. Love dropping by and am always amazed at your energy and enthusiasm, Alex! Josh Whedon certainly attracts some rabid fans, doesn't he? I have met a Firefly FANATIC and she keeps pushing the show on me. 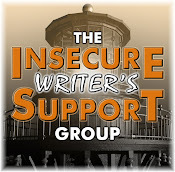 ;) What exactly is the Insecure Writers Group? I've seen that Nicki Elson is part of that. 1.) How could you put up three rockers with guitars and not put up one with you rockin' out to a guitar where the face was blacked out? 2.) I absolutely loved the Hunger Games movie. I saw it this weekend so I contributed to that amazing Box Office. I liked it way better than the book. *Ducks behind wall as people throw rocks at me. I stand by what I say though...Movie > book. 3.) Rusty is extremely talented. Haven't given any money to the Hunger Games and probably won't. I have been following Stormy though - very cute posts. I want to see the Hunger Games but havin't yet. I think Lockout looks good. My hero is... my dad. He has never stopped, always worked hard, and never passes up an opportunity to say "I love you." Jennifer, there is a tab up above under my header that explains it. Michael, because I'd be so far down on that list it would be depressing! CLee, that's why I usually hit the movies right away. Julia, Bono is a good person. And your dad sounds like a wonderful person. Tracy, I didn't know that! Hero is a great H word. And what's even cooler is you've blogged about your guitar heroes. What a lovely tribute to your friend! I'll go visit. I too have been catching the daily adventures of Stormy they are very cute. I haven't seen Hunger Games will probably wait until it comes to Redbox now. wow, someone who knows Dream Theater. Those were some great heroes. I love the gnome blog. Rush rocks! cabin in the woods looks interesting. Ooh! I thought about posting about the Hunger Games for H. Love the books and was very pleased with how they did on the movie. It was awesome! And, I'm totally laughing at Cassie's comments up top! lol. She's awesome! No desire to see the Hunger Games. Such violence does not appeal to me. I think it must be more a really young person's movie. I get my movies on tevee or Netflix these days. I am doing my best to visit all the blogs this month and then will go back later (using the list) and choose those I wish to follow. I am up in the 400's right now. I feel almost like a little froggy, I am doing so much hopping. Ha ha ha. I'll see Hunger Games eventually. I'd like to read the book first though. Already following Rusty, since one of the last blogfests, I think. Hero? aside from Hubby? Jack Kerouac, Jean-Paul Sartre, Isaac Asimov. Heroes! That's what I should have used for H. It would've fit so perfectly with my theme. Thanks to you, Alex, I just became Rusty's 300th follower. And now I want a burger. Oooh, can't wait to check out Stormy the Gnome's adventures. Hi Alex, the Ninja Hero, and I thought you were going to highlight Lee the A - Z challenge hero ..
Mina, you should! How rude. Savannah, they've been one of my favorites for over twenty years now. Leigh, she was just so excited, wasn't she. Ruby, you are a trooper. Thanks for stopping by! DG, ironically Logan's Run comes out on DVD tomorrow! Good for you, Robyn! Thanks for following him. Emily, of course. Be wrong otherwise. Hilary, he is, but I'm not highlighting any of the hosts since we are already getting attention. I'm looking forward to Hunger Games, Lockout and Cabin in the Woods! We got a babysitter and went to see Hunger Games, but it was sold out. Wrath of Titans was good, though. I'm thinking it was better than the first. 103 comments -- Gee whillikers, Alex, how do you even have a life? One of my heroes is Eleanor Roosevelt. I need to check out Rusty...will do that right now. I've been following all the of the blogs you have featured the last two times. Maybe I'll achieve ninja status yet! And yes, I did contribute to The Hunger Games' box office take. I wouldn't mind seeing it again either. I don't have a theme. But I liked the hunger games movie! Awesome H, Alex!!!! I've not contributed to The Hunger Games box office take. . . I started the book, but set it aside to read something else and do some writing. I MIGHT pick it back up. LOL!!!!! The hero in my life besides Jesus is my sweet hubby. He's so supportive and encouraging I couldn't ask for a better person for a soul mate! I have lots of heroes. Must of them writers. Great H post. Rusty deserves the props. I'm just hoping he never really understands how much, because his head might explode. I do not follow Rusty, but will check him out. I like all kinds of music, Aerosmith being my fave. I did go see HG and liked it. The books were better, of course. I do not know Heather and Stormy, but will check them out as well. My hero? Brandon Sanderson. If I can write half as good a fantasy story as he does, I will be a happy author. Shannon, it couldn't be worse. Karen, I do - really! Lynn, those are awesome heroes. Andrew, doubt that will happen. Sabrina, hope you become a very happy author then. I finished read Hunger Games on Sun. afternoon. I can see why the kids can't put it down. Every chapter has a cliffhanger, a few twists, and a really smart female protagonist. Although, she's a bit dense in the love department. Poor Peeta. RUSH! That was my brother's most favorite band. I did go and see the Hunger Games, and I might just have to see it again. I really enjoyed it! Too many guitarists to mention, but the two who have had the biggest impact on moi: Steve Howe and Jimi Hendrix. 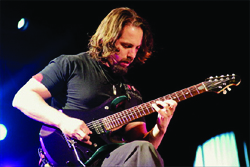 Great choice, Alex--John Petrucci. I'll have to listen again to Alex Leifson. His music doesn't stand out for me in memory. Jake, my son, says you're spot on with Dave Mustane. As for me, remember my first love is Spanish music, and I played it for some years. My influences would be Andre Segovia, Ottmar Liebert, Liona Boyd, and, are you ready for this? Carlos Santana. He's an awesome guitar player. Hunger games. Haven't seen it yet, but my son and his girlfriend did. She's read all the books. Her opinion, books are much better, although she feels the movie captured the essence of the books. I don't know Rusty, heading over to his blog next. I've seen Hunger Games once and that was when it first came out, so I'm not contributing. Damn, that's a lot of money. I wonder if the author gets a percentage of that or if they just get a flat amout to sell their rights? Aww, such a sweet tribute to your hero Rusty. I've got to go see the Gnome right NOW. My first hero was guitarist Ritchie Blackmore of Deep Purple. Mary, no one said love's perfect! Jennifer, tell your brother he rocks. Steve Howe was great, Christopher. Sia, Santana does not surprise me. And tell Jake he is a cool rocker dude. Then again, you are a cool rocker dudette. Jessica, I guess it depends on her contract. Rusty is an awesome blogger! Nope, haven't contributed to THG box office numbers . . . they're quite impressive. You're stoked to see Cabin? Then you really do like horror, which I usually don't (too much blood and fear). But I hope to finally see The Hunger Games this weekend. I loved the series and I want to see how they brought that grim future world to life. Finally saw The Hunger Games today and thought they did a great job with it. While I found the jumpy camera work irritating I appreciate that it was used the most to cover the worst of the violence. I watched the trailer for Cabin, and it pretty much gives away the twist. So pointless. Helena, yeah I like a good horror flick. Morgan, you're going to make me blush. Donna, thanks for the jumpy camera warning. Moody, it's still being praised by the critics though. Must be more to it than that. 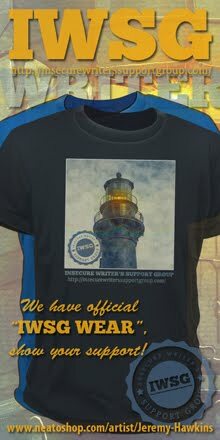 And no, I'm not going to start singing the words to that Tina Turner song, "We don't need another hero.."
Ah yes, Rusty Webb and the possible inspiration behind the '"Insecure Writer's Group". It seems to be a general theme amongst writer's that they have those niggling self doubts. Of course, I have never considered myself a writer as such. Just someone who uses his formulation of words as a therapeutic and cathartic resource. I choose what may seem the easy route. I just let my fingers dance upon the keyboard and see what happens. Ah yes, Rush and that fine guitarist from that legendary Canadian band. Perhaps you have heard of another Canadian band named "Mahogany Rush"? The lead guitarist, Frank Marino, is one of my guitar heroes and very underrated, in my opinion. I haven't seen Hunger Games, yet. I'm hoping to go soon. Can't play the guitar, but admire those who can. I don't know Rusty. Off to check out Rusty, Heather and Stormy next. I saw Hunger Games and loved it. I know that there were a few things missing, but overall they stuck to the story and the casting was terrific! Hero is a great "h" word! Thanks for sharing. Wow, what a great tribute to your friend! I am definitely going to check out Rusty's blog. I love Joss Whedon and can't wait to see the Cabin. Here I am at the bottom again...I have always been enamored of Jimmy Page. His creativity and talent seem one-of-a-kind. And it never goes out of style. I listen to Zeppelin with the same awe today as I did 40 years ago. I hit the Hunger Games a couple weeks ago and thought it rocked. Not surprising it is doing this well. Rusty is a great guy. Also I'm a fan of Alex Leifson and Rush. He's one of the best. Gary, I do know Mahogany Rush. And you are a writer my friend - and a far better one than you realize. Cherie, I try to play! Chuck. you are never in the bottom in my book. Cindy, that makes you awesome! We went twice to 'Hunger Games', yes we did. My hero (after Jesus Christ)? My husband--he is steadfast, loving, lovable, and makes me laugh. I'm now following Rusty. His burger made me hungry! I totally want to see "A cabin" now. Can't wait. Rachel, glad you finally got to see it. I love all the blogs you've featured. Ahh Dave Mustaine, how do you still have skin on your fingers? He is one of the undisputed shred lords of the universe, indeed. I'm following Rusty and that gnome is hilarious!